William Calomiris Co.,LLC-Intergrated Real Property Services. Overview: Located in the midst of North Georgetown and Glover Park, Highview Towers is North of Calvert Street on the West side of Wisconsin Avenue and adjacent to the Russian Chancery. Its views are among the most spectacular available and afford panoramic vistas of Washington DC, reaching as far as the United States Capitol and beyond. Conveniently located to both the Georgetown University and Hospital, The National Observatory and the National Cathedral and convenient to shopping, restaurants and public transportation. 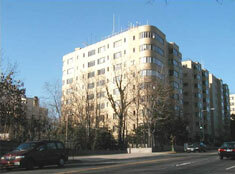 This eight-story building consists of efficiencies and one bedroom apartments on each floor. Some units are newly renovated. There are laundry facilities and a full time manager on the premises. All units are equipped with central air conditioning and heating and the building is cable ready. CALL YOU BACK, ITS QUICK & ITS FREE!